Miller PhotographyStudents at Emma Lazarus HS on the Lower East Side attempt to arrange strips of paper with single words or sentences into a coherent paragraph. It’s no surprise to find rocks on display in an earth science class. But at Emma Lazarus HS on the Lower East Side, words and sentences in laminated paper strips share desktop space with the rocks. On a recent morning, the 32 students in Michael Giovacchini’s class worked in teams as they perused these bits of text — single words such as “obsidian” and sentences such as “Intrusive is a type of igneous rock” — and attempted to arrange the puzzle pieces into a coherent paragraph. Miller PhotographySchool secretary Francesca Rosa (left) and Chapter Leader Jaime Abramowitz in front of a bulletin board that illustrates the different countries and languages represented at the school. The students are all English language learners from Haiti, China, Korea and Uzbekistan, among other countries. Some 14 different languages are spoken at the school. “They’re learning content but we’re also giving them language cues to learn how a well-written paragraph should read,” Giovacchini explained. It’s all part of the scaffolding they need to master English at the same time that they tackle difficult high school topics, from science and math to literature and U.S. history. 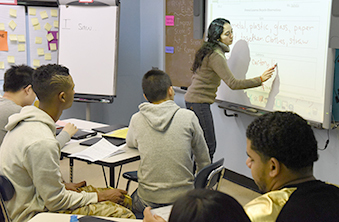 That’s by design: Principal Melody Kellogg founded Emma Lazarus HS in 2009 to focus on the needs of older English language learners. “We give our students context for the lesson through visuals and hands-on projects,” Kellogg said. 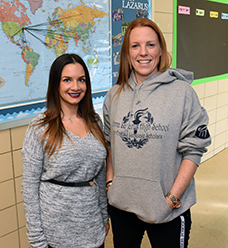 As a transfer school, Emma Lazarus accepts only students who started high school elsewhere, either in another part of the city or in another country. Many of the Miller PhotographyTeacher Dustin Brumit shows examples of how students study ESL through art. school’s 250 students found their way to Emma Lazarus after faltering in other city public schools. Nearly 90 percent of the students receive free or reduced-price lunch. Kellogg estimates that the school each year loses 10 students who have to work to assist their families. Many students are in households with multiple children, while others are living with relatives because their parents are not in New York City. Emma Lazarus HS has drawn national attention because the school has achieved dramatic results: Student pass rates on Regents exams in algebra, geometry and U.S. history have exceeded 90 percent. Newsweek magazine cited the school as one of the top 20 in the country — and No. 1 among high-performing high schools serving low-income students. 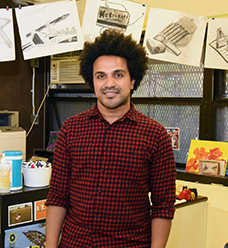 Every class at Emma Lazarus is taught in English — it’s an immersion, not a bilingual, program. English as a second language is taught as a separate class, and students who need extra help can obtain tutoring during lunch and in the evening. Students are mixed together to encourage them to practice their English skills. Miller PhotographyTeacher Soleil Sabalja uses a smartboard during this ESL lesson. Technology plays a role — laptops are used extensively in class, but not for translation. LoBuglio said students are allowed to read up on a topic in their native language to better grasp the classroom discussion. Students also can access lessons online to prepare for class the next day. Online lessons also enable students to work collaboratively, she said. Students hone their English through internships at architectural firms, hospitals and the district attorney’s office — work experience that also helps them decide on college studies. Photo displays around the school commemorate visits to college campuses and locate where recent alumni are now studying: Queens College, Fordham, Syracuse and SUNY Binghamton. Students are eager to share their college plans. Maftuna, from Uzbekistan, wants to study international relations in college. Fedy, from Haiti, wants to study to be a doctor. “Then I want to go back to Haiti,” he said. To help these students achieve their goals, the school’s 17 teachers meet twice a week to discuss strategies to help each student.